We couldn’t keep this one to ourselves, globetrotters! 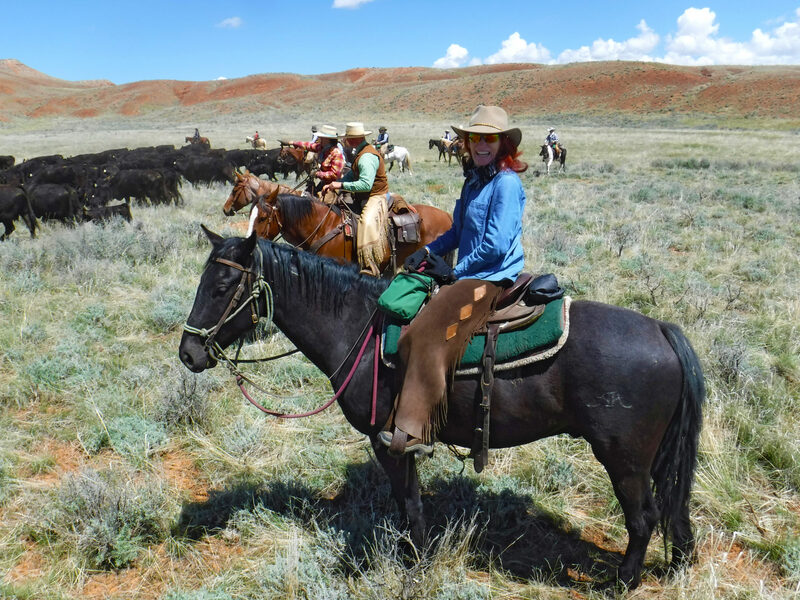 Anne Cowell recently had the experience of a lifetime on her horse riding holiday in Shell, Wyoming. From the very first moment she met the ranch staff, Anne knew this would be a trip to remember. And although her husband had taken a little convincing, not being a horse rider himself, he loved the prospect of the other activities offered at the ranch (think fly fishing, shooting, archery…) and ended up riding every single day! If you’ve been thinking about signing up for this incredible ride in Big Sky cattle country, read on!! Were there any stand-out experiences with the accommodation and meals that you would like to mention? Everything was top-notch. Wonderful accommodation and meals. Were you happy with the horse/s that you rode? They were absolutely fabulous horses. On the first day I rode a Quarter Horse called Handsome. For the next 2 days I rode a Mustang called Midnight – he was a great horse to ride during the cattle move. And on the last 2 days, I rode a Mustang called Kicker (he didn’t kick!) – he had a lovely temperament and was a beautiful dark palomino. Were you happy with the standard of tack on the ride? Yes. They were so comfortable – none of us got sore in the saddle even after a full day’s ride. Did you have a favourite day or experience while on your globetrotting holiday? It was all incredible. The scenery was exquisite, so every day was amazing. However, from a riding perspective, I have to say that I enjoyed the day of cattle rounding/moving the best… it was a long day and very noisy as the cows and their young calves had a lot to say about being moved, but it was a wonderful experience and gave us the opportunity to ride quite independently, although according to some basic ‘rules’. Such a fun, exhilarating, rewarding (and exhausting) day. 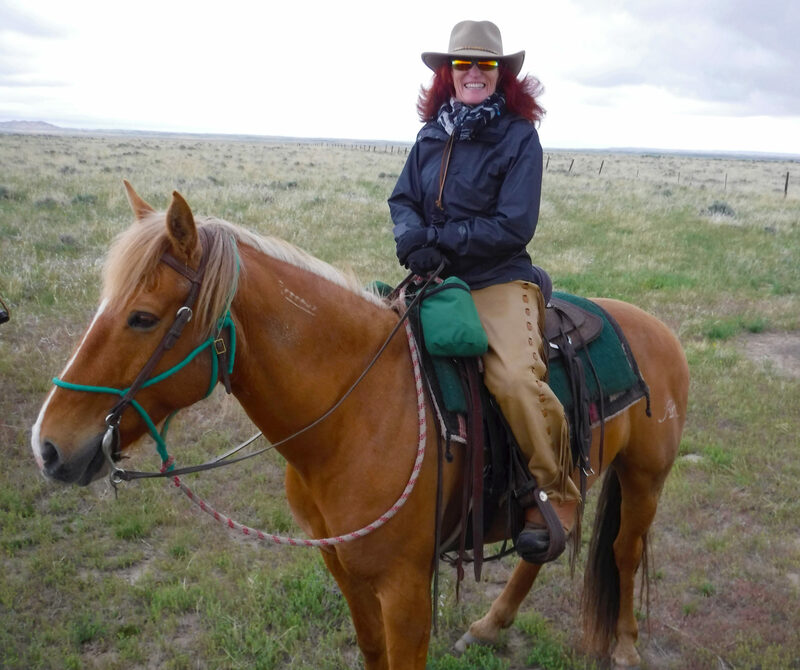 And then there was the day out riding near the wild mustangs… such an honour to experience that! Regarding your guides, were you happy with their level of service, knowledge of the environment and hospitality? Wow! The wranglers were fabulous. They had great knowledge of the environment and were super company. They kept us safe but at the same time were lots of fun. And they took some great photos of us on the rides. In terms of value-for-money, how would you rate this particular ride? When I booked I didn’t even want to tell my hubby the price, as he would have told me no way! He isn’t a rider but I was able to convince him we should go due to the fact that they offer non-riding activities such as fly-fishing, shooting, archery, etc. He thought he may try a couple of short horse rides. He ended up riding EVERY day and loved every minute of our time there. So after he experienced the top-notch facilities, accommodation, horses, rides, other activities, and hospitality, he is of the same opinion as I am – that it was fantastic value for money. I knew I was going to enjoy myself on this riding holiday, but to the extent that I did… well I totally underestimated that. From the moment we were collected at our hotel in Cody, to meeting the other guests, the staff, seeing the wonderful accommodation, grounds and setting, my every expectation was exceeded ten-fold (or more). And then the action started! This guest ranch is exceptionally well run and maintained. My jaw literally dropped when I saw the barn and tack room and the trailers and vehicles. Watching the horses being brought in from the paddocks was heavenly. 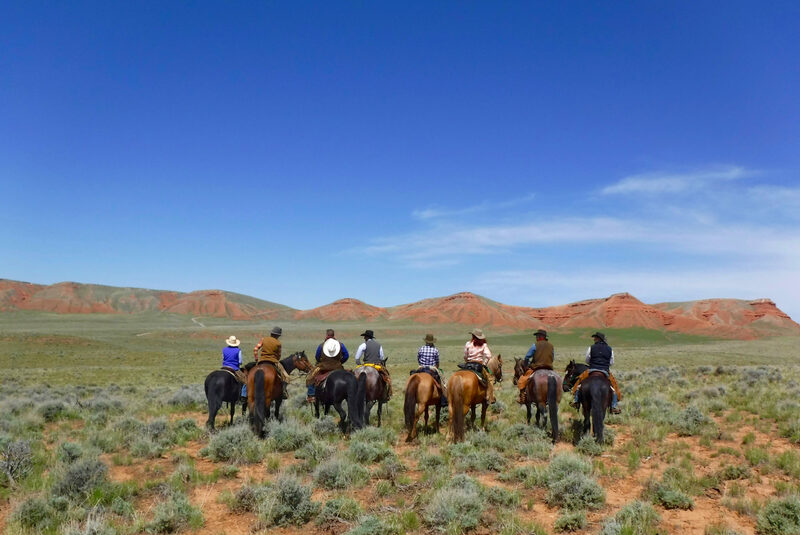 The riding was exceptional – the horses were amazing, the scenery incredible and the wranglers were absolutely fantastic. Our rooms were super-comfortable, the meals mouth-watering, the cocktails delicious (and strong), the company exhilarating. We were treated like VIPs but at the same time as a family with such warmth. The hosts have achieved an impressive balance of professionalism and friendship. Everything about this holiday was top-notch… the absolute best. Just writing this makes me tearful with wonder… words cannot adequately express my gratitude and appreciation that I had the opportunity to have such an amazing experience. I would return in a heartbeat. Whew! I don’t know about you, but I’m ready to don my cowboy hat and gallop off into the mountains! Find out more about the Shell, Wyoming ride here.